All in one washer dryer units are gaining popularity for those opting for smaller living spaces. Whether you are interested in buying one for your RV, your apartment, or to cut energy costs, we’ll show you some of the best all in one washer dryer units available. 1.0.1 What Is an All in One Washer Dryer? 1.0.2 How Does the Machine Work? 1.0.3 What Are the Benefits of Using an All in One Washer Dryer? 1.0.4 Who Could Use and All in One Washer Dryer? 1.0.5 Where Can You Buy a Washer Dryer Combo? Before presenting our reviews of the best washer dryer combo machines, let’s first cover some frequently asked questions about this dual-function machine. What Is an All in One Washer Dryer? You likely know what a washing machine and the companion machine that dries wet clothes is. If you don’t, they usually come in the form of two giant and massively heavy machines that do our laundry for us. An all in one washer dryer eliminates the need for two machines by combining the power of both into one package. These machines are also called washer dryer combos. From a user perspective, the washer and dryer combo is easy to use. You place dirty clothes into the machine and when you return they are clean and dry. Often the drying function occurs automatically after the washing cycle is finished. From a technical perspective, the all in one combo washer dryer works differently than the traditional washer and dryer machines. Washing in the combo machine is basically similar, but often a combination washer dryer will have a front-loading design. Things heat up with the differences between a conventional dryer and the dryer on an all in one machine. Conventional dryers shoot hot air onto clothes and tumble them around until they are dry, all while dispelling hot air out through a vent. The vent releases all the hot air and steam from the machine through a tube linked outside. This dryer venting action is why you sometimes catch a whiff of drying clothes while outside. Dryers in combo machines don’t work this way. The machine blows hot air onto clothing but also uses a steam cycle to soften clothes. Because the dryers don’t have a vent to expel excess heat, drying takes a lot longer than in a conventional vented dryer. By and large, the dryers in all in one machines are also condensation dryers. The condensation process explains where the hot air goes when the machine doesn’t have a ventilation system to expel the heat. These dryers recirculate the hot air in a loop pattern. What Are the Benefits of Using an All in One Washer Dryer? Who Could Use and All in One Washer Dryer? 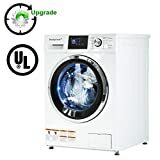 All in one washer dryers are suitable for anyone who wants to save space, conserve energy, or wants a cheaper price tag than found on traditional laundry machine sets. Saving space with a combo machine is a given. Of course, one machine is smaller than two machines, but the combo is typically even smaller than the average washer or dryer. These machines are ideal for RVs, small apartments, and tiny homes where space saving is a necessity. All in one machines are also typically more energy efficient than standard American washers and dryers. To buy, a combo unit costs less, and using one could decrease your energy and water bills. Where Can You Buy a Washer Dryer Combo? Washer dryer combos are available for purchase on Amazon and through other online household appliance retailers. You can also purchase them at appliance stores. We’ve reviewed some of the best all in one washer dryer units on the market to see how they compare with each other. We looked at their features, RPM spinning speeds, dimensions, pros and cons, price, and warranty to present you our verdict for the best option available right now. Prices vary significantly for the all in one combo washer dryer machines featured in our review. Some cheaper models fall in the $$ price range. The most expensive laundry combo units are priced in the $$$ range. Price isn’t always indicative of quality, but it can reveal which features the machine might include. The compact Splendide all in one washer dryer is made to clean clothes quietly, and made with RV use in mind. The machine features a wash capacity of 15 pounds and a drying capacity of 11 pounds. The max spin rate is 1200 RPM. Cycle options offered by Splendide WD2100XC include 10 for washing and three for drying. You can control the water and heat temperatures, choose spin settings, and drying times. This machine is 23.5 inches height by 22.6 inches width by 33.1 inches in length. It weighs around 145 pounds. The Splendide washer dryer combo costs around $$$ on Amazon. Make sure to register your Splendide all in one washer dryer with your proof of purchase and registration card through the mail. Warranty information is ambiguous about this product. Consult with the retailer about the warranty terms directly before buying this machine. The LG WM3997HWA Ventless 4.3 Cubic Foot Capacity Steam all in one washer dryer has a spin rate of 1,300 RPMs and 14 washing settings. It comes with a larger than average door and tub for the compact size of the machine. The machine offers a TurboWash setting for getting your laundry done quicker. It also offers five temperature settings for the wash that include cold rinsing cycles. The size of the LGWM3997HWA is 30 inches long by 27 inches wide by 39 inches tall. The machine weighs 205 pounds. The LG WM3997HWA washer dryer combo is available on Amazon from around $$$ to $$$. This machine comes with a 10-year limited warranty. The Best Appliance all in one washer dryer is equipped to handle up to five pounds for washing and drying cycles. It spins at 1,200 RPM and uses a 360-degree circulating hot air mechanism to remove odors from clothing. The 24-inch BestAppliance washing machine with dryer has an antibacterial door seal for maximum sanitation with continued use. Dimensions for the BestAppliance compact combo washer and dryer are 26 inches long by 26 inches depth by 35 inches for height. The weight for this product isn’t immediately available, although the shipping weight is around 185 pounds. Amazon sells the BestAppliance 24-inch washer dryer combo for around $$. There are differing reports for the BestAppliance warranty. Some buyers have received warranty repairs while others claim the company doesn’t offer a warranty. For precise warranty information, contact the seller of the machine before buying. The RCA RWD200 is a small capacity all in one washer dryer suitable for very small areas. It features 12 separate wash cycles to accommodate a variety of fabric types. The spinning speed is 800 RPM. Pre-rinse and extra rinse cycles are also available. This washer dryer combo comes with controls for overflow, overheating, automatic drum balancing, and self-cleaning. For convenience, this machine also allows for a delayed start and comes with adjustable feet. Product dimensions for this washer dryer combo are 24 inches for length by 23 inches for width by 34 inches for height. It weighs in at 177 pounds. Amazon sells the RCA RWD200 for around $$. This RCA all in one washer dryer is backed by a one-year warranty. The LG WM3488HW all in one washer dryer combo machine spins at a maximum speed of 1,400 RPM and contains a 2.3 cubic foot capacity. This combo machine includes 14 wash, dry, and cleaning settings. There are 10 option features including those for pre-washing, delayed washing, extra rinsing, and finished signals. The dryer is a ventless condensing dryer that takes between 30 and 120 minutes per dryer run. Additional features include the LG TrueBalance anti-vibration system, the NeveRust stainless steel drum, and an automatic water leveling adjuster. Product dimensions for the MW3488HW by LG are 25.5 inches for length, 24 inches in width, and 33.5 inches for height. It weighs 156.5 pounds. This all in one washer dryer costs around $$$ on Amazon. The LG WM3488HW comes with a one-year parts and labor warranty. When purchased directly from LG, the product comes with a 10-year Direct Drive Motor warranty and a lifetime warranty for the drum. The compact Haier HLC1799AXW combo washer and dryer is built with functions to allow for washing only. The machine has adjustable legs to level the machine on any flooring. Delayed starts can be set up to 24-hours in advance. The machine comes with a stainless steel drum and a variety of temperature settings. The RPM spin speed capacity for the HLC1700AXW is 1200. This washing and drying combination machine has the dimensions of 22.5 inches for length, 23.4 inches for width, and 33.5 inches for height. The Haier HLC1700AXW is found on Amazon for around $$$. Haier’s HLC1700AXW all in one washer dryer comes with a one-year parts and labor warranty. When purchasing this combo machine directly from the vendor, it comes with a two to five-year cabinet warranty and a one-year labor warranty. There are many all in one washer dryer options available on the market today. Many of them offer great space and energy-saving features, but there are always drawbacks. Deciding to buy an all in one washer dryer might mean relinquishing any expectation that the machine will function like the dual full-sized washing machine and clothes dryer you are accustomed to. All in one combo machines use different technology to get the job done, thus producing slightly different results. The best all in one washer dryer we’ve reviewed today is also one of the more affordable choices. The LG WM3488HW all in one washer dryer has the fastest spin cycle at 1,400 RPM. It washes and dries clothing most efficiently. Even as the best model on our list, this machine will not perform exactly as a traditional set of laundry machines will.